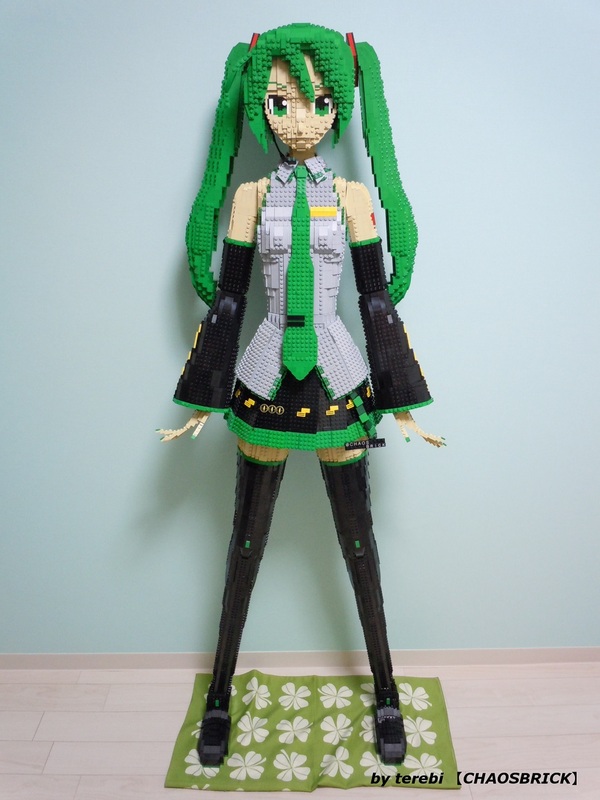 It’s been almost three years since Japanese builder Chaosbrick (カオス煉我) created the first LEGO version of the wildly popular digital pop star and Vocaloid character Hatsune Miku (初音ミク). Since then there have been plenty of other versions, by such builders as Moko, Mike Dung, LegoWyrm and even yours truly. But now Chaosbrick has returned to outdo them all with this life sized version! It’s fantastic especially his dedication to building a life size model, I do not mean to sound like I am nit picking but presenting it on a towel/blanket takes away from the grandeur, maybe he could revise this by doing a LEGO version of it! DOMO ARIGATO for a wonderful work! Impressive build indeed – and truly remarkable that it stays in one piece. I get that the ‘fan service’ is part of the genre, but I’m not sure that linking to that image was the right approach for The Brothers Brick. This MOC is FANTASTIC! Big fan of the Miku Hatsune games! Can’t get enough of “Project Diva F”! Captured her in this MOC perfectly! It is amazing the way one’s culture influences them even in their work in LEGO. I checked out his/her other stuff and to my surprise each MOC I saw had and Asian influence. I deeply understand this because I have often paid homage to my Italian heritage in many of my MOCpages creations! Impressive, certainly. The largest one yep, probably. But even though I may not be a Hatsune Miku fan or know much about it, I am a fan of mathematics and LEGO brics. By my calculations, it should not be much larger than a metre or so.